Review date: 2 March 2001. 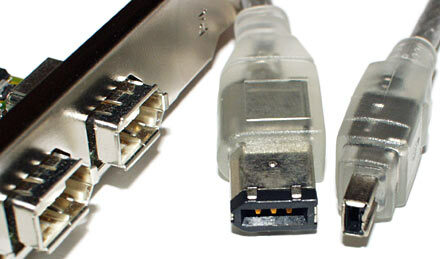 IEEE-1394, or FireWire, is an interface that is now actually good for something. When Apple first developed FireWire, its main market was digital video people. Various digital video cameras come with a FireWire connector, and it lets you move your video to and from the camera in digital form. Zero loss, easy editing. Very tasty. You can plug all sorts of devices into IEEE-1394, though. FireWire is fast, it's plug-and-play, and it's transparently supported by recent editions of Mac OS and Windows. It's got a lot going for it, technically. If you didn't have a DV camera, though, FireWire wasn't originally very interesting. Some expensive external hard drives used it - well, actually they were and are all IDE devices with bridge hardware to make them work with 1394, as I explain in my review of a cheap box that lets you do the same thing here - but that was about it. And there weren't many computers, besides Macintoshes, that had FireWire ports built in. And adapter cards that let you add them to other machines were expensive. Nowadays, though, there are more FireWire devices. Still not scads of 'em, but enough to justify, for many people, the purchase of the cheap PC FireWire controller cards now available. Things like external CD writers and hard drives and memory card readers that are available in USB versions, but not very fast, are now coming in IEEE-1394 versions that cost little more, and work better. 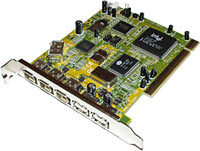 PC FireWire controller cards generally give you three FireWire ports on the back of your computer, and one internal FireWire connector, which is of questionable utility as there still aren't any native FireWire drives on the consumer market. Not a big deal, as some FireWire devices have passthrough ports that let them be used daisy-chain style, and you can get USB-style FireWire hubs as well. Extra ports are just a convenience factor. What if you want more than just IEEE-1394, though? What if you'd also like a nice fast IDE hard disk controller, so you can add up to four more cheap drives to your computer, and even make a RAID array out of them if you like? Or perhaps you'd like a USB controller as well as your FireWire one. Well, here are the cards for you. These two "Centos" combination FireWire-and-something-else cards actually come in boxes with "Cherri" branding. But Cherri's site is currently a default Microsoft IIS page with a lot of Chinese text on it, whereas Centos' site actually, like, exists. Since both sites were registered by Centos Inc, let's put it down as Another Mystery of South-East Asian Computer Product Naming and go with the latter, shall we? ...with the standard three-plus-one FireWire ports, and two USB ports as well. The Centos CI-6950, on the other hand, has the same FireWire ports as the 6900, plus two ATA/100 IDE connectors, powered by a Highpoint HPT370 controller which lets you set up RAID 0, 1 and 0+1 arrays. I explain what this is all about, and how painful it is to make RAID work on flaky hardware, here and here. In brief, IDE RAID controllers let you turn two or four hard drives into a single device that's faster, or less prone to data corruption, or both. And with the current driver versions, even the cut-rate Highpoint controllers work just fine. 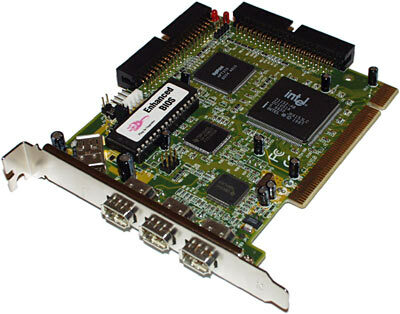 You can use any IDE drive you like on these controllers, but this controller will work with everything up to and including the current ATA/100 hardware at the fastest bus speed the drive supports. RAID on a card like this won't give you a giant system performance boost. But striped IDE RAID sets are significantly faster for disk-intensive tasks, and RAID 0+1 is a great way to get a really reliable, really big storage device happening, for mission-critical computing on a budget. Not a big budget, either. Every time I price ATA hard drives, the darn things are closer to being given away in corn flakes boxes. You can get sixty gigabyte Quantum drives for $AU500 a pop, delivered, these days. And if you want a set of four 30Gb drives for a 60Gb RAID 0+1 set, they'll be yours, delivered, for less than $AU1350. 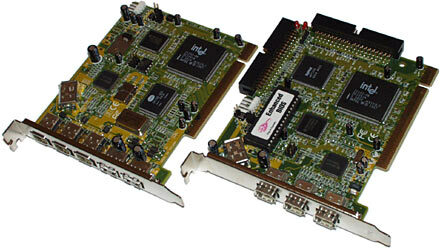 ...while the CI-6900 kit is simpler. 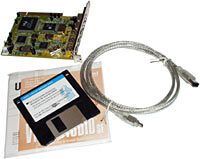 Both Centos cards come with an IEEE-1394 cable, with a full-size 6-pin FireWire connector on one end and a little 4-pin connector on the other. The 4-pin connector's what you'll find on pretty much every FireWire-supporting video camera; all it lacks are the power supply pins, which are used to run smaller FireWire gadgets, and to power the hardware that allows FireWire devices to daisy-chain, even when some of the devices in the chain are turned off. Digital video cameras that support FireWire commonly don't actually come with a FireWire cable. But other devices that need all six pins generally do come with a cable - which is often built into the device, in the case of little memory card readers and the like. So it's good to get a 6-to-4 pin cable with the card. Some other FireWire cards I've seen have come with a six-to-six pin cable, which is no good for camera connections. Sony, by the way, uses nothing but four pin connectors on all of their 1394 gear, and calls this format "i.LINK". This is a good thing, of course; I think we can all agree that there just aren't enough technologies that have been relabelled by marketing people, and that this sort of behaviour clearly causes no confusion at all. The Centos cards also both come with Ulead VideoStudio 4.0 Basic SE Low Cost Crummy Software Bundle Edition, an editing package which is better than you might think given the fact that its little paper manual proudly says "The Fastest Way To Greate Great Videos" (emphasis mine) on the cover. 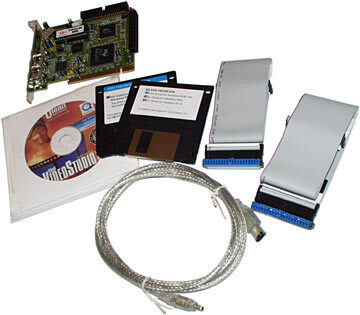 You also get a floppy disk with DV camera drivers on it, for Windows versions that don't have one included, and there's an OK paper manual for each card as well. If you're using Windows 98, 2000 or ME, there are drivers for USB and IEEE-1394 cards built right into the operating system. Power down, install card, power up, watch Windows find the drivers, shazam. Well, probably reboot and then shazam, but shazam just the same. Installing the CI-6900 is, therefore, straightforward, if you're running one of the abovementioned operating systems. About the only decision you have to make is whether or not to attach a floppy power plug from your computer power supply to the card. Both of the Centos combo-cards have a power connector on them; they let you draw power for the FireWire bus directly from the computer power supply, instead of from the PC's possibly-overtaxed PCI bus. If you do opt to use the floppy power connector, there's a jumper you set to make it work, and there's another jumper that lets you bypass the card's protection diode. The diode's there to stop the card from being fried if there's another powered device on your 1394 bus. If there isn't one, bypassing the diode lets the card supply more current. Leave the diode enabled unless you're running various bus-powered devices and have problems running them all. The CI-6950's RAID controller needs special drivers installed. You can chance it with the HPT370 drivers on the included floppy, or download the latest drivers from Highpoint's page here. The 6950's FireWire ports work whether or not the IDE controller driver's been installed. If you want to use the 6950's IDE controller alongside the existing controller(s) on your motherboard, no problem; it'll just work, provided your computer hasn't had a resource allocation problem and installed the new controller on top of something else that doesn't want to share. You press control-H during startup to enter the HPT370 BIOS setup program and configure your drives; it's all quite straightforward, and covered in the manual. If you want to actually boot from the HPT370, though, you probably won't be able to manage it. Your motherboard's BIOS may allow you to disable the onboard controllers and boot from another one, or it may let you set an extra controller's drive as the first boot device, or it may offer no such option. Note that not every BIOS that says you can boot from another controller actually allows you to do it. There's nothing wrong with booting from a single drive on the motherboard controller, and putting your applications and swap file and whatever else on a RAID array that's, say, drive D, for most applications. Elegant, no. Effective, yes. The CI-6900 sells locally for $AU203.50 delivered, and the CI-6950 for $AU225.50 delivered. This is pretty good pricing, for what you get, but it's not a huge bargain. A plain FireWire adapter card with the same three-external-and-one-internal port layout as these cards will set you back less than $AU105, and a two port USB card is less than $AU65. An ATA RAID card like Promise's FastTrak100 is more than $AU240 by itself, but you can get rather cheaper IDE RAID cards. Abit's Hot Rod 100, for instance, uses the same HPT370 controller the Centos card uses, instead of the arguably superior Promise chipset, and should sell for less than $AU100, if you can find an Australian dealer who carries it. If you buy separate cards, you can therefore get the same features as the CI-6950 for roughly $AU200, and the same features as the CI-6900 for roughly $AU170. A lot of people, though, just can't do this. They don't have enough slots spare. There are lots of modern motherboards with six PCI slots, and if you only have, say, a sound card and a network card installed (with your graphics card in the AGP slot), then there are plenty free for 1394 and hard drive controllers and extra USB ports. But, even though current machines are meant to share IRQs elegantly, they don't necessarily, and particular slots can end up close to useless. I explain the various PC system resources and why they matter in my old Step By Step column here, by the way. These days, most users don't need to worry about them, with ACPI steering devices onto IRQs largely independently of what slot they're installed in. But, depending on your motherboard and OS, you may still be stuck with particular problems - two of your PCI slots, for instance (the first one and the last one) can be stuck to the same IRQ as the graphics card, and problems can arise if you put cards in those slots that don't play nice. Or you may have a slimline microATX or FlexATX computer, with not many PCI slots in the first place. If, one way or another, you've only got one spare slot, $AU25-30 isn't much to pay to compress two cards into one. These cards do what they say they do, the price isn't silly, and they come with cables and decent documentation. Worth checking out.